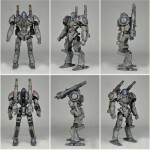 Summer Wonderfest has just taken place in Japan and among the many new figures, statues and replicas revealed at the event are coloured versions of the Plamax Gipsy Danger and Cherno Alpha model kits from Max Factory! 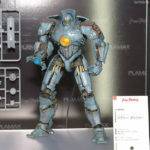 Uncoloured prototypes have been seen at previous Wonderfests, but this is the first time these Pacific Rim Jaegers have been seen in colour and with more concrete release info. These 1/350 scale model kits do not currently have a set price, however according to the information on their display cards both kits will be released in December! Planning to add these figures to your collection? Be sure to comment after the jump! Pacific Rim at ToyFair 2014- Closer Look at Upcoming Kaiju & Jaegers! NECA’s ToyFair display includes an impressive display of Pacific Rim figures! 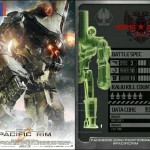 In addition to the already-released Gipsy Danger & Knifehead toys, we also have a close look at the upcoming “TRESPASSER” Kaiju along with two more Jaeger figures: the Russian Cherno Alpha and the Japanese Coyote Tango, both impressive (if probable final) entries in the Pacific Rim toyline. 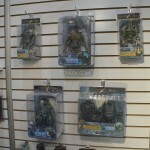 Be sure to check out ToyArk’s full Pacific Rim Toyfair gallery! 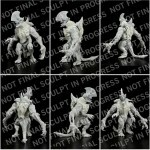 This past weekend, someone(BaronButcher) asked NECA on Twitter about figures of the Jaegers Cherno Alpha, Coyote Tango and Trespasser. NECA’s response? So there you have it. Judging from the comments here since Pacific Rim debuted, a lot of you want a 7″ Cherno Alpha. Would you like a 18″ Striker Eureka too? How about other Kaiju and Jaegers? Discuss! According to NintendoLife, Yuke’s is both developing and publishing the Pacific Rim video game. No word on which consoles but considering the source is a Nintendo site, it could be for the 3DS and/or WiiU. 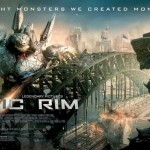 Thanks to I Am Rogue, we can have a look at the huge banner made for Pacific Rim! Just a few more months until Pacific Rim hits theaters! You can see two of those exclusive pieces by Doug Williams right here. The first puts the overwhelming scale of the Jaegers into perspective, as a Russian collosus stands guard, dominating the skyline. The second features a freaky Skull Temple that’s fused with its derelict urban surroundings. 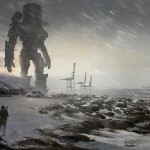 Click on the headline to check out the concept art from Pacific Rim!